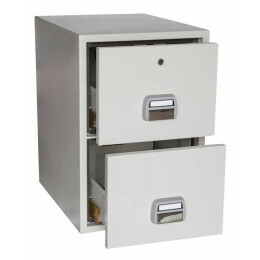 Filing Cabinets organise your documents, but only a fully tested fire resistant filing cabinet can organise your documents, secure them and protect them from fire. 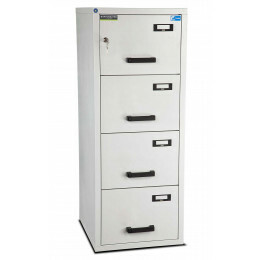 Fire Resistant Filing Cabinets offer complete fire security for your important and valuable paper documents. 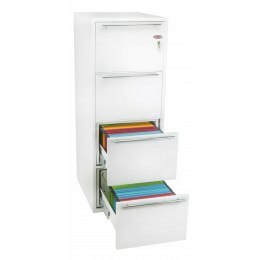 Choose from 2 drawer, 3 drawer or 4 drawer filing cabinets in either conventional vertical designs or lateral side filer format. 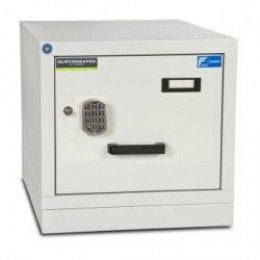 We offer fireproof resistance from 1/2 hour, 1 hour, 11/2 hours or 2 hours and with cabinets tested to UL, NT Fire 017 or VDMA 350. 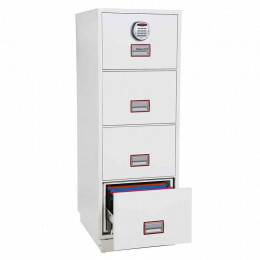 Fire Filing Cabinets not only protect vital documents from being damaged or destroyed by fire, heat and smoke, but Fire resistant Filing Cabinets also offer real security from theft, unlike standard office filing cabinets. 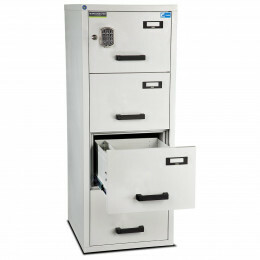 Safe Options offers Fireproof Filing Cabinets with 2, 3 or 4 drawer versions and if you require extra storage capacity we also offer Lateral Files, which are available in 2 and 4 drawer versions. 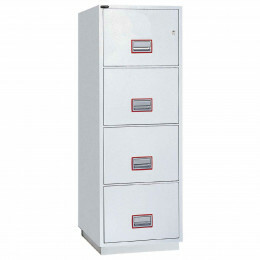 Fire filing cabinets are designed and built to store and protect your paperwork in event of a fire. There are several models on the market that are built to varying standards of security and fire resistance. Selecting an appropriate fire filing cabinet can therefore be difficult. To help you find a cabinet to suit your requirements, we’ve put together this informative FAQ. 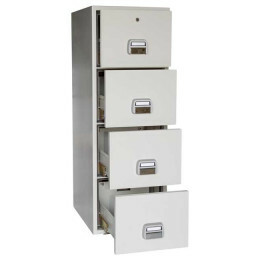 What type of fire filing cabinet should I choose? 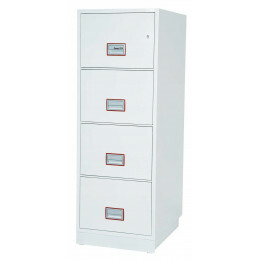 Initially you should ask yourself what features you require from a new fire filing cabinet. What level of fire resistance do you need/prepared to pay for? 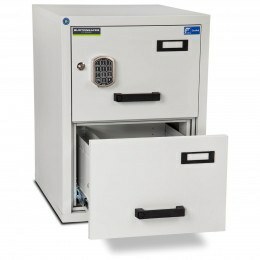 How secure will the documentation held inside the cabinet need to be? Which size paper will be stored, A4 or foolscap? Who should have access to the cabinet? Should any drawers be restricted? What levels of fire protection are available? 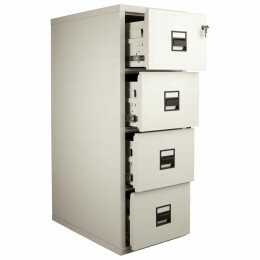 Fire resistant cabinets are manufactured so that the inside of the cabinet does not exceed the temperature at which the stored paper will become damaged or burn. Cabinets are available with different fire resistance levels: 60, 90 and 120 minutes. 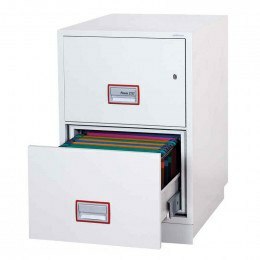 This means that the paper stored inside can be protected by the cabinet for up to 60, 90 or 120 minutes before perishing, depending on the cabinet’s rating. 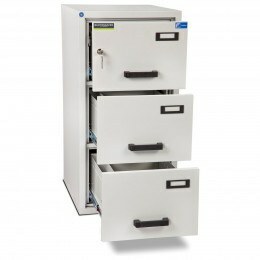 There are currently several standards of fire protection which cabinets are tested at the above temperatures, including Nordtest NT Fire 017, EN1047-1 and UL72, so look out for these when selecting your cabinet. What security measures do the cabinets have? 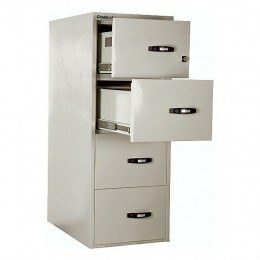 We offer fire cabinets with quality security features. 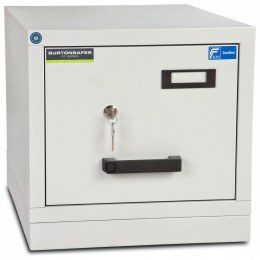 You can choose from a choice of lock types: key, fingerprint (biometric) and digital electronic. 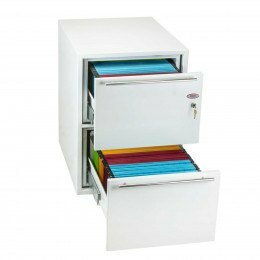 Several cabinet models are fitted with versatile locking systems that allow access to certain drawers while others remain locked. 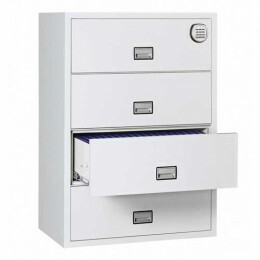 They can be set-up so selected drawers can be open during office hours but locked at night and access to certain drawers can also be restricted only to management. 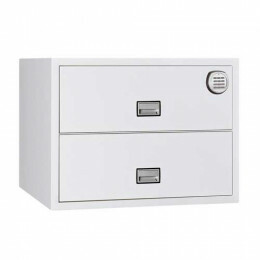 What size drawers do I need? 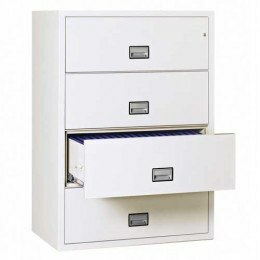 A standard full-capacity drawer is 31-inches in length but some manufacturers produce a cheaper 25-inch long drawer. These models are cheaper due to the cost of full-length drawer runners, which have to be sturdy enough to take the weight of a fully-loaded 31” drawer. 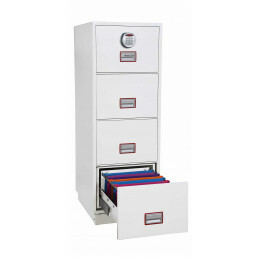 You should also check if the drawer can accommodate A4 or foolscap suspension files, depending on your requirements. 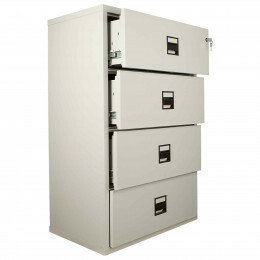 How much should I spend on a fire filing cabinet? As with most purchases, you should take into account how much money you want to spend. 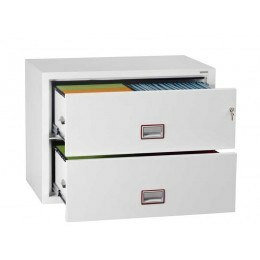 Then decide how secure your filing cabinet will need to be, what you will store in it and how much fire protection you will need. 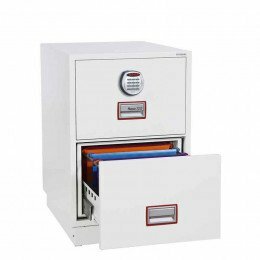 Bear in mind that the more expensive the fire filing cabinet, the better the materials, security features and fire protection will be. If you have read through all of the above FAQ and you still cannot find what you were looking for, then please get in touch with us. Give us a call on 0800 567 7549 or send us an email where our experienced and knowledgeable staff shall assist you with your query.